Healthy Fit Goddess: Gluten-sensitive or not? One of my New Years Resolutions this year is to eat not eat gluten/wheat. I got tested for the genetic mutation that causes celiac disease last year but I do not have it. However, many people, including medical researchers and doctors, have claimed that non-celiac gluten sensitivity may exist. I just came across this article on the topic on the NY Times website. When I first started eating vegan, whole-wheat bread was a much bigger part of my diet than in the past year. I slowly phased wheat out more and more from my diet as the idea of gluten sensitivity became more popular. I've always noticed that eating wheat does make me feel extra full and a bit sluggish after eating it. 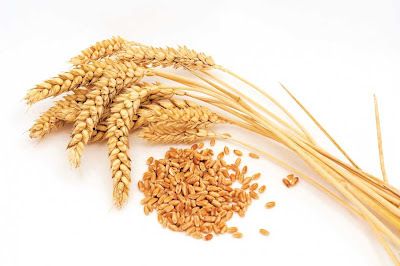 In the most basic form, it seems that my body exerts more energy (thus the tired feeling) to digest wheat, perhaps because gluten (a composite of starch and proteins) is more difficult to break down. And I've also noticed that white bread and tortillas make me feel much worse than sprouted wheat, like Ezekiel 4:9 bread. So maybe there is a refined flour issue here too? Wheat (and gluten) was only introduced into the human diet 10,000 years ago so the digestive tract has not had the time to evolve to digest it yet (the whole premise of the Paleo Diet). I think that there is a lot we don't know about whether humans can digest wheat or not, as mentioned in the NY Times article. Another point to make is that casein (found in dairy) is a similar protein to gluten and digested by the same enzymes in the intestine. I know for sure that I am sensitive to dairy (and not necessarily lactose-intolerant) so this makes me think that I may also be gluten sensitive. Interesting enough, the Autism Research Institute is now recommending a gluten-free, casein-free diet for autistic children because it seems that symptoms improve after adopting this diet. A fellow blogger, Mara, at Cheap & Simple Vegan also decided to do the gluten-free experiment for a month. She tested eating wheat at the end of January and realized that it made her feel awful so she decided to go gluten-free for good. I took her idea of testing eating wheat again this past weekend. First, I ate a Potbelly sandwich with whole-wheat bread after my workout on Friday. It did not immediately made me feel bad. However, I did feel more tired than usual in the afternoon, and I had to drink some coffee to feel motivated enough to do chores around the house. I also ate out at a Mexican restaurant that night and had tacos with white flour tortillas. Again, I did not feel bad immediately but I did feel extremely full and barely ate half of my meal. I ate a couple more bread things throughout the weekend. I must say that I feel much more tired than usual this week so far. I also ate other unhealthy things this weekend like alcohol, sugar, and even some cheese dip (thank you Superbowl). So, I can't attribute my tiredness to gluten. Therefore, I am going to continue gluten-free for the rest of the month and then try to eat wheat again (without other toxins) and see how I feel. Have you tried the gluten-free experiment?